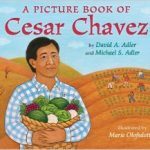 Since Cesar Chavez’s Birthday is a state holiday in California, children ages 4-7 should be introduced to this notable humanitarian with a simple storytime. You can include books on Latino culture, as well as books that celebrate workers. For a craft project, make traditional paper picado or paper flowers. You could also do activities that honor farm workers, such as decorating small pots and planting seeds in the pots to take home. Adler, David. A PICTURE BOOK OF CESAR CHAVEZ. Quotes from Chavez highlight this overview of his life. Altman, Linda. AMELIA’S ROAD. Child of farmworkers, Amelia dreams of having a permanent home. Bunting, Eve. GOING HOME. When a family visits Mexico for Christmas, the children realize the sacrifices their parents have made for them. Krull, Kathleen. HARVESTING HOPE: THE STORY OF CESAR CHAVEZ. Focusing on the grape-workers strike, this brief biography of Chavez has a nice storytelling voice. Mora, Pat. TOMAS AND THE LIBRARY LADY. Based on a true story, Tomas, son of migrant farm workers, visits a library. Perez, L. King. FIRST DAY IN GRAPES. Chick starts third grade at a new school, when his family moves to take jobs harvesting grapes. Slade, Suzanne. CESAR CHAVEZ: CHAMPION AND VOICE OF FARMWORKERS. With dramatic illustrations, this brief biography highlights some of the events in Chavez’s life. Also see the previous Cesar Chavez’s Birthday storytime ideas page from December 2002.